Turkey on Friday slammed Austria over its decision to shut down seven mosques and expel 40 imams. 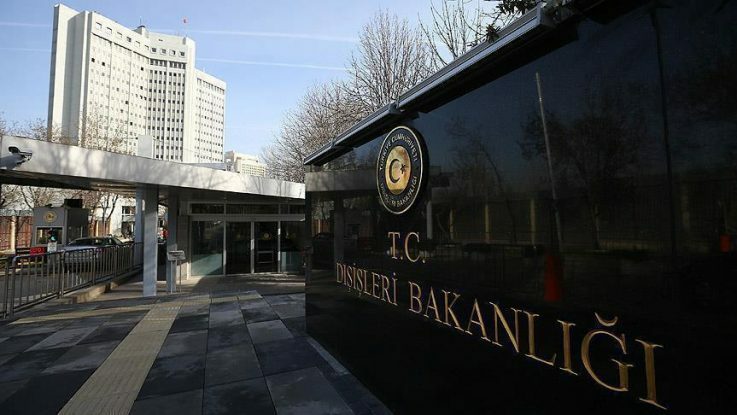 In a written statement, the Foreign Ministry said it “regretted” the Austrian move against the mosques and the decision to not grant residence permits to religious officials sent from Turkey to Austria. “We condemn Austrian politicians, especially Chancellor Kurz, for trying to achieve political interest from these alarming developments, rather than fighting racism, islamophobia and xenophobia and the rise of the extreme right,” it said. “The ideological stance of the Austrian government is contrary to universal legal norms, social cohesion policies, minority law and the morality of living together. The normalization and the banalization of Islamophobia and racism must be rejected with certainty,” it added. The statement also said Austria’s move also contributes to the rise of Islamophobia and racism in Europe. It added that this decision also affects ongoing efforts to normalize ties between Turkey and Austria, and the harmony of Turkish community in Austria. Speaking to reporters in central Kirsehir province after Friday prayers, Deputy Prime Minister Bekir Bozdag termed the Austrian move as “unacceptable”. Bozdag described the decision as “the destruction of freedom of religion and conscience, and the values that define Europe”. He said Austria’s move also reflect “the violation of the European Convention on Human Rights”. “It is not possible for Turkey to accept this,” he added. Bozdag said that the decision of the Austrian government would greatly damage the Austrian state through the rise of Islamophobia, racism, extremism and discrimination. Earlier Turkey’s presidential aide Ibrahim Kalin on his Twitter account said Austria’s move to close seven mosques and expel imams “is a reflection of the Islamophobic, racist and discriminatory wave in this country”. “It is an attempt to target Muslim communities for the sake of scoring cheap political points,” he said. Kalin said the Austrian government’s “ideologically charged practices are in violation of universal legal principles, social integration policies, minority rights and the ethics of co-existence”. “Efforts to normalize Islamophobia and racism must be rejected under all circumstances,” he added. Foreign Minister Mevlut Cavusoglu said Austria’s controversial decision “shows the point some countries, politicians have reached in racism and Islamaphobia”. Cavusoglu said the same racist Islamophobic politicians will drag Europe to the edge of an abyss. He vowed to stand against such injustices and to defend the rights of Turkish expats. Earlier on Friday, Austrian Chancellor Sebastian Kurz announced that seven mosques will be shut down in the country while 40 imams will be expelled on grounds of being foreign funded. Speaking at a news conference with Vice Chancellor Heinz-Christian Strache and EU Affairs Minister Gernot Blumel, Kurz said the move was part of a crackdown on “political Islam”. Kurz said an investigation on several mosques and associations conducted by the Ministry of Interior and Office of Religious Affairs had been concluded and the activities of seven mosques were found to be forbidden — one of the mosques belongs to the Turkish-Islamic Cultural Associations (ATIB). In 2015 when Kurz was Austria’s minister for Europe, integration and foreign affairs, he had backed Austria’s “law on Islam” (Islamgesetz) — a legislation that, among other things, banned the foreign funding of mosques and imams in Austria. The controversial law, which eventually passed through parliament, was intended to develop an Islam of “European character,” according to Kurz. “We act decisively and actively against undesirable developments and the formation of #parallelsocieties — and will continue to do so if there are violations of the #law on Islam,” Kurz wrote on his Twitter account.